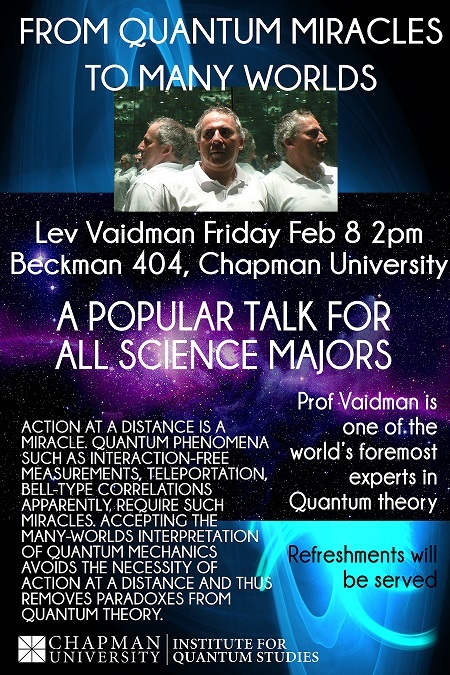 + - A popular talk from Lev Vaidman! From Quantum Miracles to Many Worlds by Lev Vaidman. February 8th @ 2PM in 404 Beckman Hall. Abstract: Action at a distance is a miracle. Quantum phenomena such as interaction-free measurements, teleportation, Bell-type correlations apparently require such miracles. Accepting the many-worlds interpretation of quantum mechanics avoids the necessity of action at a distance and thus removes paradoxes from quantum theory. 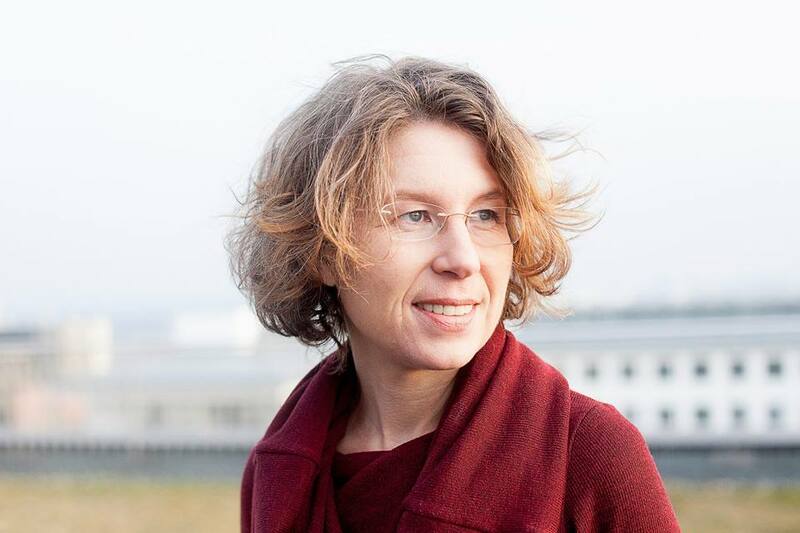 How Beauty Leads Physics Astray by Sabine Hossenfelder. November 29th at 7PM in 208 Argyros Forum. To develop fundamentally new laws of nature, theoretical physicists often rely on arguments from beauty. Simplicity and naturalness in particular have been strongly influential guides in the foundations of physics ever since the development of the standard model of particle physics. In this lecture, Dr. Hossenfelder argues that arguements from beauty have led the field into a dead end, and discusses what can be done about it. 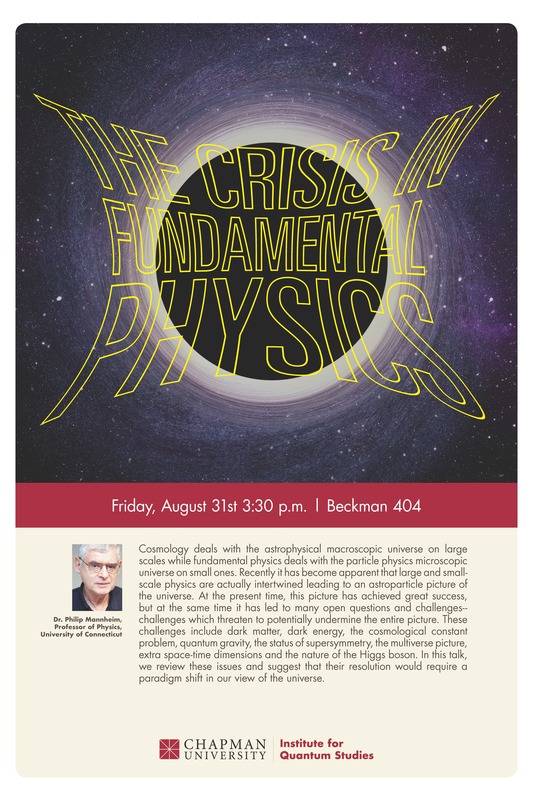 Dr. Philip Mannheim, Professor of Physics at the University of Connecticut presents, "The Crisis in Fundamental Physics" on Friday, August 31st @ 330PM in 404 Beckman Hall. Abstract: Cosmology deals with the astrophysical macroscopic universe on large scales, while fundamental physics deals with the particle physics microscopic universe on small ones. Recently, it has become apparent that large and small scale physics are actually intertwined, leading to an astro-particle picture of the universe. At the present time, this picture has achieved great success, but at the same it has led to many open questions and challenges - challenges which threaten to potentially undermine the entire picture. These challenges include: dark matter, dark energy, the cosmological constant problem, quantum gravity, the status of supersymmetry, the multiverse picture, extra space-time dimensions, and the nature of the Higgs boson. In this talk, we review these issues, and suggest that their resolution would require a paradigm shift in our view of the universe. 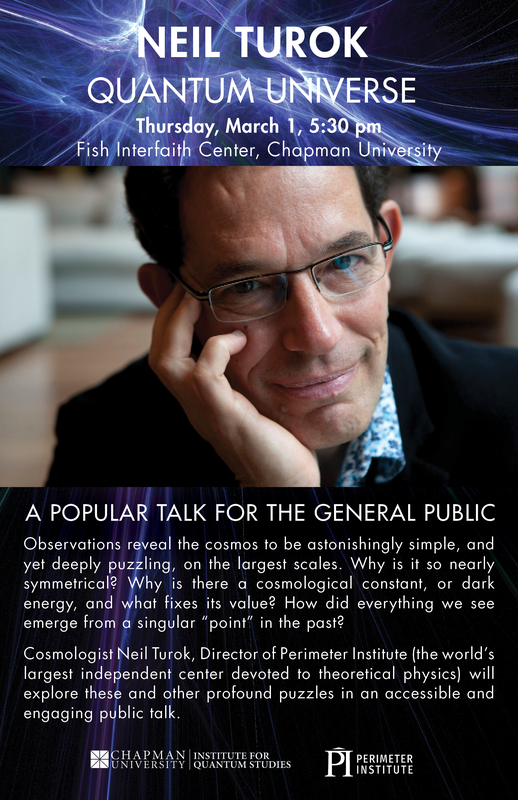 Dr. Neil Turok, Director of Perimeter Institute for Theoretical Physics in Waterloo, Canada, presents "Quantum Universe" on Thursday, March 1st @ 530PM in Fish Interfaith Center. Abstract: Observations reveal the cosmos to be astonishingly simple, and yet deeply puzzling, on the largest scales. Why is it so nearly symmetrical? Why is there a cosmological constant, or dark energy, and what fixes its value? How did everything we see emerge from a singular "point" in the past? Dr. Andrew Jordan (University of Rochester) and Dr. Kater Murch (Washington University in St. Louis) present, "The arrow of time in quantum mechanics"
Abstract: The question of why we perceive time moving from past to future is perplexing, especially in light of the fact that microscopic laws of motion are the same running forward or backwards in time. Some have thought that the answer to this puzzle may lay in quantum wavefunction collapse. 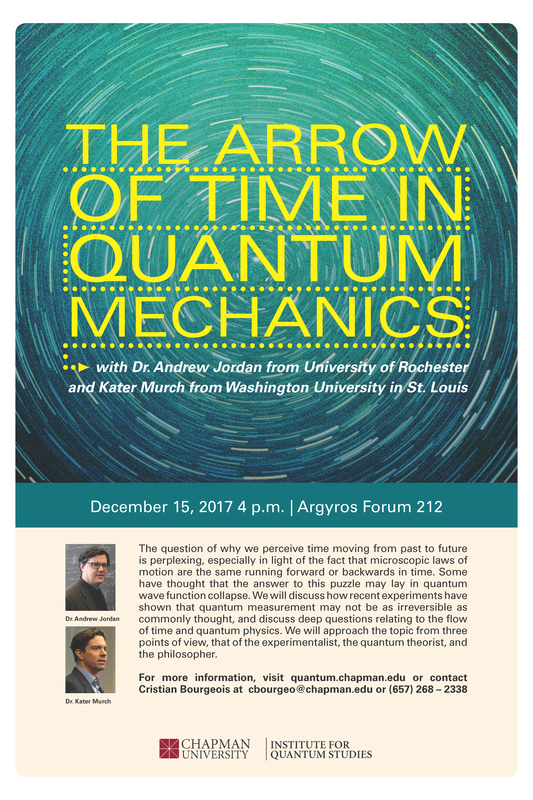 We will discuss how recent experiments have shown that quantum measurement may not be as irreversible as commonly thought, and discuss deep questions relating to the flow of time and quantum physics. We will approach the topic from three points of view, that of the experimentalist, the quantum theorist, and the philosopher. 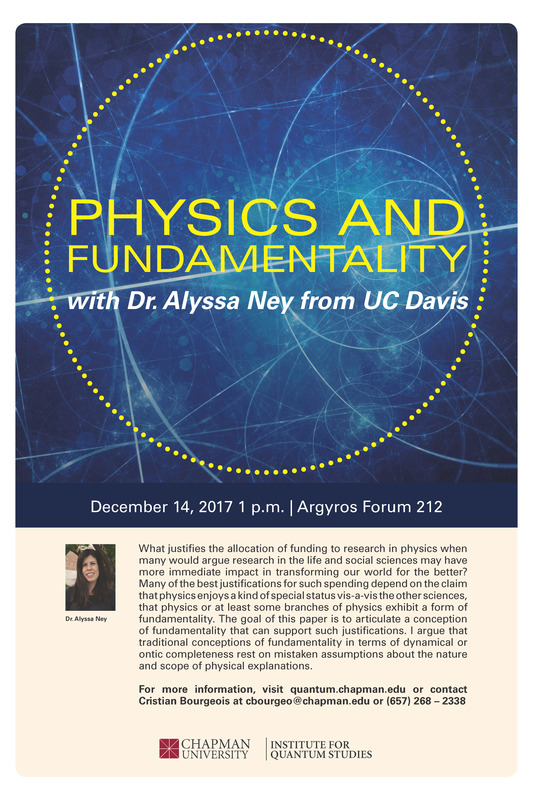 Dr. Alyssa Ney (from UC Davis) presents, "Physics and Fundamentality"
Abstract: What justifies the allocation of funding to research in physics when many would argue research in the life and social sciences may have more immediate impact in transforming our world for the better? Many of the best justifications for such spending depend on the claim that physics enjoys a kind of special status vis-a-vis the other sciences, that physics or at least some branches of physics exhibit a form of fundamentality. The goal of this paper is to articulate a conception of fundamentality that can support such justifications. I argue that traditional conceptions of fundamentality in terms of dynamical or ontic completeness rest on mistaken assumptions about the nature and scope of physical explanations. 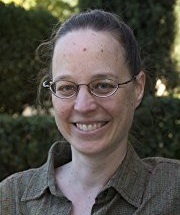 Dr. Kater Murch (from Washington University in St. Louis) presents, "Measurement and control in superconducting qubits: from the quantum Zeno effect to quantum enhanced metrology"
Abstract: The quantum Zeno effect is a feature of measurement-driven quantum evolution where frequent measurement inhibits the decay of a quantum state. 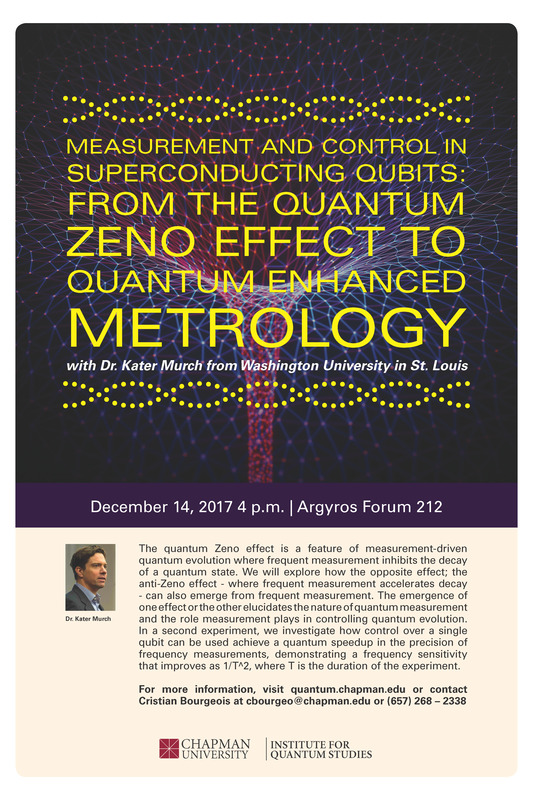 We will explore how the opposite effect; the anti-Zeno effect - where frequent measurement accelerates decay - can also emerge from frequent measurement. The emergence of one effect or the other elucidates the nature of quantum measurement and the role measurement plays in controlling quantum evolution. In a second experiment, we investigate how control over a single qubit can be used achieve a quantum speedup in the precision of frequency measurements, demonstrating a frequency sensitivity that improves as 1/T^2, where T is the duration of the experiment. 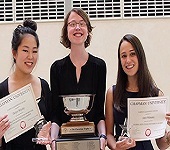 Senior Taylor Lee Patti, triple Physics, Math, and Spanish Major (with a Chemistry Minor), receives Chapman's prestigious Cecil F. Cheverton Award, the highest honor the university awards to only one student annually. She has 2 peer-reviewed journal publications: one in the field of biochemistry and food science in collaboration with Dr. Rosalee Hellberg, and the other in quantum foundations with Dr. Yakir Aharonov, National Medal of Science recipient and Director of Chapman's Institute for Quantum Studies. Congratulations! 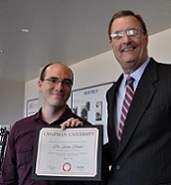 Dr. Justin Dressel awarded Wang-Fradkin Professorship at Chapman's 22nd Annual Faculty Honors Convocation, May 2017. Dr. Eleanor Rieffel presents, "A NASA perspective on quantum computing: opportunities and challenges"
Dr. Sandu Popescu, Professor of Physics at University of Bristol and a member of Chapman's Institute for Quantum Studies, is among 50 distinguished scientists to have been elected as Fellows of the Royal Society. Congratulations to Institute for Quantum Studies! 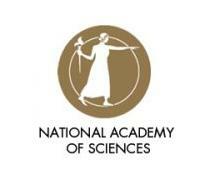 The Proceedings of National Academy of Sciences will bestow the Cozzarelli Prize this year to Yakir Aharonov, Fabrizio Colombo, Sandhu Popescu, Irene Sabadini, Chapman University President Daniele C. Struppa, and Jeff Tollaksen in recognition for their article "Quantum violation of the pigeonhole principle and the nature of quantum correlations." To read the story behind the science, click here! Congratulations! 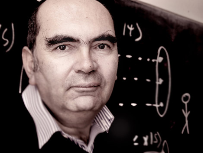 Professor Sandhu Popescu to receive the Dirac Medal from the Institute of Physics in recognition for "his fundamental and influential research into non-locality and his contribution to the foundations of quantum physics." Watch Professor Popescu's "Non-locality beyond quantum mechanics" recorded seminar at Chapman University. Watch Professor Popescu's "The smallest possible thermal machines and the foundations of thermodynamics" recorded seminar at Chapman University. Congratulations! Dr. 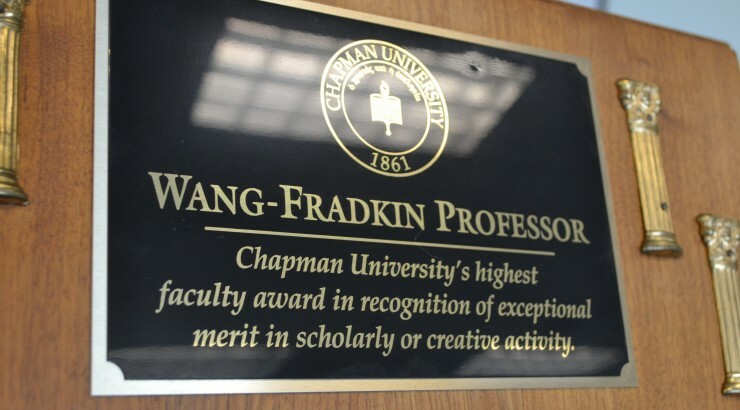 Professor Roman Buniy awarded Wang-Fradkin Professorship at Chapman's 21st Annual Faculty Honors Convocation, May 2016. 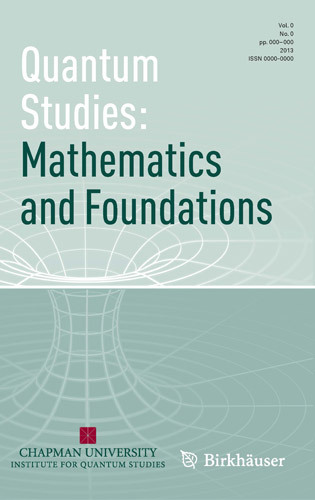 Read the Quantum Studies: Mathematics and Foundations Article of the Year - Heisenberg scaling with weak measurement: a quantum state discrimination point of view. Congratulations to the authors - Andrew Jordan, Jeff Tollaksen, James Troupe, Justin Dressel, Yakir Aharonov. Superoscillations were identified independently by Sir Michael Berry and Yakir Aharonov in very different contexts, but in the last several years the communities of mathematicians and physicists have taken increased interest in this phenomenon, both because of its interesting mathematical characteristics, and because of its many potential applications. 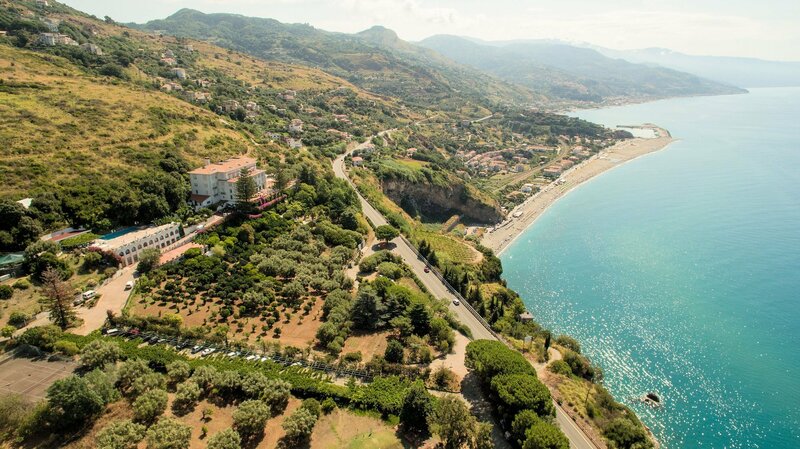 This symposium is intended not only to present the state of the art on (theoretical and applied) research on superoscillations, but also to look at the future of this field. Click here for more conference info. 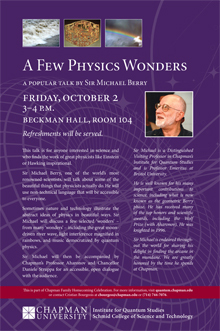 Sir Michael Berry came visiting Chapman campus ready to talk about some of the beautiful things that physicists actually do. Intentionally accessible to anybody, this free and open to the community colloquium uses non-technical language and a multi-media experience. A Few Physics Wonders is generally appealing to an audience interested in science, especially those who find the work of other great physicists, like Einstein or Hawking, inspirational. Following his fun, standing-room-only popular talk, Sir Michael Berry hosted an open, five-part series of technical seminars focused on Superoscillations, and concluded with a supplementary sixth presentation from his Divergent Series: From Thomas Bayes's Bewilderment to Today's Resurgence Via the Rainbow. To help celebrate Yakir Aharonov's 80th birthday, a party of the world’s most acclaimed physicists mingled at Chapman University and spoke to our conference on the foundations of quantum physics.